The words “wisdom teeth removal” seem to strike fear into the heart of so many, but don’t believe all of the rumors! It’s actually a very routine and straightforward procedure. The confusion that surrounds the development of wisdom teeth can also make whether they need to be removed even murkier. Since wisdom teeth develop later in life – generally fully forming by our mid-20s – many people may not know enough to judge whether they’ve become a problem, especially if they don’t receive regular dental care. Knowing more about your wisdom teeth and how they develop can make it far easier to deal with problems that arise, and can help to simplify any decision about wisdom teeth removal you need to make. With that in mind, here are a few common questions many of Dr. Mann’s patients have about their wisdom teeth. 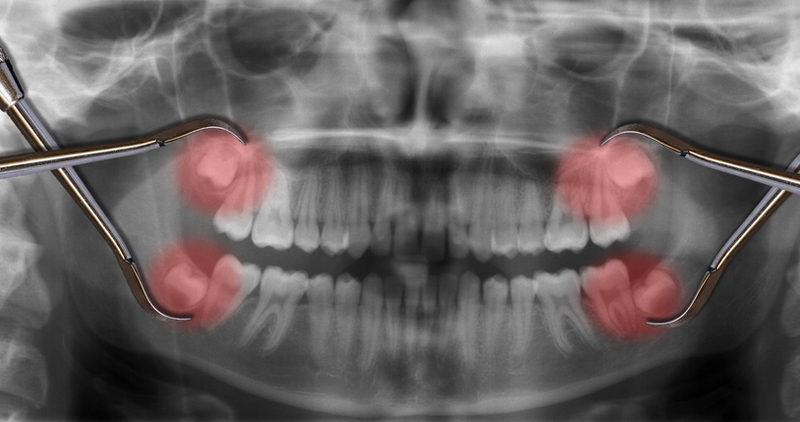 Wisdom teeth, also known as 3rd molars, are the teeth furthest back in the mouth. Many people do not have adequate jaw length to allow the wisdom teeth to fully erupt and become functional. Not to mention, caring for wisdom teeth can become cumbersome, if not impossible, to keep clean due to their location in the mouth. This can lead to tooth decay, gum disease, and infections. Why does my dentist want them out if they aren’t bothering me? For those lucky enough not to experience the discomfort that arises with an infected wisdom tooth, it may be confusing as to why your dentist would encourage you to extract teeth that aren’t currently creating any pain or problems. As dentistry has evolved over time, so has our awareness of the repercussions and risks associated with leaving the wisdom teeth alone until they become problematic. The 2nd molars are important teeth used in chewing food, but they are put at risk by impacted wisdom teeth. Many times a small area in the gum tissue will open, allowing food to get caught down between the wisdom tooth and the back side of the 2nd molar leading to decay, and in some cases, loss of that important tooth. There are several benefits to getting wisdom teeth out when you’re younger. First and foremost, our ability to heal is greater when we are younger. Secondly, when people are in their late teens or early twenties, they don’t typically have full root formation which means less risk for surrounding structures such as nerve (lower jaw) and sinus (upper jaw). The other thing to keep in mind is that by waiting for a wisdom tooth to become an issue prior to extracting it, it can be challenging to get the tooth numb for removal. Also, some studies have suggested a longer postoperative healing process in cases involving infected 3rd molar removal. Let’s get down to the brass tacks of the wisdom tooth removal process! First of all, it’s best to schedule a consultation to meet with your oral surgeon to discuss the specifics of your treatment and the anesthesia options. Many of our patients choose to have sedation anesthesia for the treatment. As removing wisdom teeth can be more involved than a typical dental procedure like fillings or crowns, going to sleep for the procedure can be helpful. This requires not having anything to eat or drink for 8 hours prior to treatment, having a responsible driver to take you home and the inability to drive or operate machinery for the next 24 hours. On the day of your procedure we will start an IV which is utilized to administer the medications that will make you sleepy. Medications are given in small doses until the desired sedation is achieved. You will also be monitored throughout the procedure for safety. Once you have drifted off to sleep, the oral surgeon will give you injections of local anesthetic into the areas of treatment; this has a twofold effect. Firstly, being numb during the procedure allows the doctor to use fewer sedation medications, which means less time waiting in recovery after the surgery is completed. Second of all, you will wake up numb and comfortable with plenty of time to settle in at home and take your first pain pill prior to the local anesthetic effects diminishing. Everyone’s wisdom teeth are positioned just a little differently. Therefore, the oral surgeon will base their approach to the removal on several different factors which they will discuss with you during the consultation. After the procedure, you will be biting on gauze to help with bleeding and using ice packs to limit postoperative swelling. Plan on spending the next 2-3 days taking it easy (a great excuse to be waited on hand and foot), while eating softer foods and taking pain medication. After that time, most people are getting back into their normal routines and introducing more foods into their diet. The majority of jaw stiffness and soreness begins to subside after the first week. The surgeon will typically have you return to the office one week after treatment for a postoperative checkup. Between the internet and YouTube videos, there are plenty of misconceptions about wisdom teeth. Hopefully this has given you a little more insight into the process and eased some of your anxieties surrounding this straightforward procedure. Give Cascade Oral & Facial Surgery in Lake Oswego a call and schedule your wisdom teeth consultation with Dr. Mann to learn more.